Gray cards in photography are an way to improve the color accuracy when you’re shooting stills. It is also helpful when you want an accurate exposure with your camera. these are basically a specialized cards painted with a gray tone to give off 18 % gray shade when metered using a camera or a hand held light meter in average lighting conditions. Gray cards are ideal for situations when there is an awful amount of backlight. Backlighting is the condition when the subject is in the dark and the rest of the frame is very bright. This happens when you shoot a picture with the subject facing directly the other way to a light source. Say, the sun behind the subject. It is also suitable when a major part of the frame has a very bright tone say when you’re shooting a picture of a snowy landscape. Well the perfect gray shade is about 18% gray. Although gray as a shade is considered 50% white and 50% black or in other words half way between black and white, but for the right results an average of 18% gray is considered. This is also known as Zone V. Why 18% gray? Because tests have revealed that when we analyze the amount of gray in average shots, it contains about 18% of the gray shade. Every light meter in a camera and that of a film (in the case of film photography) is optimized to read when the 18% gray is achieved. At that point it is going to give you the go ahead to press the shutter release all the way. But there is a small problem. There is no way to let the camera know which is the subject. In a frame which has your friend’s face, a distant mountain, clouds and trees, your camera can be confused. It does not know what the subject is. So the best way to achieve the correct exposure is to measure the incident light and then manually adjust the settings where 18 % gray is achieved. Your camera meter would most probably be thrown haywire with all the dark and bright tones as described in the previous paragraph. So it is best to let the camera know what the right exposure for the scene is. 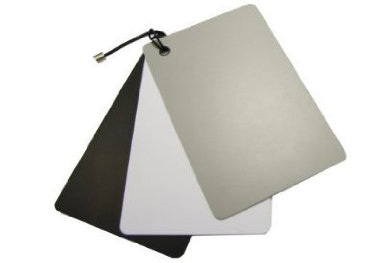 To use it, you will need to hold the gray card against the same backdrop as you would have the subject of the picture or ask your subject to hold it. Now set your cameras White Balance (WB) to nearest lighting condition or set to AUTO if not sure. Have the camera point at the gray card at an angle of 90 degrees, i.e., perpendicularly. Next hold the card at an angle of 45 degrees from the light source. If you tip it down you will let less light to enter the camera and vice versa. At that setting half press the camera shutter (in any program mode) and then allow it to meter the shot. Record the meter reading or lock the exposure if your camera is equipped with that option. Now remove the gray card and take the shot, if you have exposure lock option. If not, then get into manual mode of your camera. Adjust the shutter speed, aperture and ISO accordingly and then retake the shot. The picture will now be correctly exposed and your subject will not appear as a silhouette.